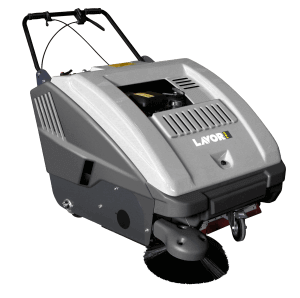 Lavor SWL 900 ST Petrol Engine Powered Walk Behind Floor Sweeper. A Honda 4HP engine powers this industrial floor sweeper machine for total portability, ideal for medium sized floor surfaces in warehouses, outside storage facilities, industrial buildings, large shopping area’s or any area that requires mechanical sweeping. The Lavorpro SWL 900 ST Sweeper has a large brush area than the smaller SWL 700 ST model at 880mm and a larger collection capacity of 60 Ltrs. Other features include, a large surface filter with manual shaker facility to prevent blockages and a pressure regulation system on the main & side brush is fitted for optimum cleaning results. Manual ?lter shaker (ST model).